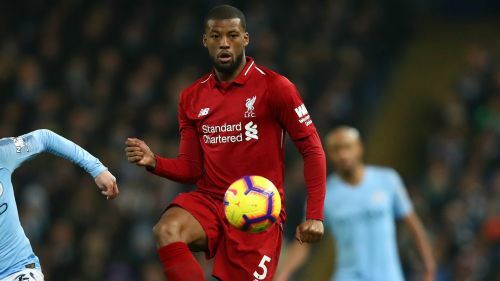 Georginio Wijnaldum insisted Liverpool must remain confident following their first loss of the Premier League season against reigning champions Manchester City. Liverpool's lead atop the table was cut to four points by City, who ended the Reds' unbeaten start to the league season via Thursday's 2-1 victory at the Etihad Stadium. Jurgen Klopp's Liverpool could have moved further clear in their quest for a first league crown since 1990, but the leaders succumbed to Leroy Sane's 72nd-minute winner in Manchester. Liverpool midfielder Wijnaldum, however, called on his team-mates not to drop their heads after the club's 20-match undefeated streak in the Premier League came to a halt. "I think we did enough to get a point and we could have won it also," Wijnaldum told Liverpoolfc.com. "We were quite unlucky with the chances but we also could lose it – like we have now. We just have to keep the confidence and try to win the next game. "They cleared well and we hit the post. They also had two or three chances so it could have gone either way; we could have won, drawn or lost. At the end, we were unlucky and they won the game. "We knew before it would be a hard game and we would have to give everything to win the game. A few games this season we were lucky we have scored goals, and tonight we were quite unlucky with the chances that we had. That's football. "Sometimes you have games where you score a lot and score with every chance that you get – and sometimes you don't. What we have to do now is to keep our confidence and win the next game." Wijnaldum added: "What we are trying to do is not look at the table – where we are standing and how much we are clear – because we can only control our own performance and we can't control the performance of [others] and their results. "We are only concentrating on our own thing; try to win our games, try to give everything and then we will look at the end of the season where we stand. We weren't busy looking at the table before and we are not going to do it this time."